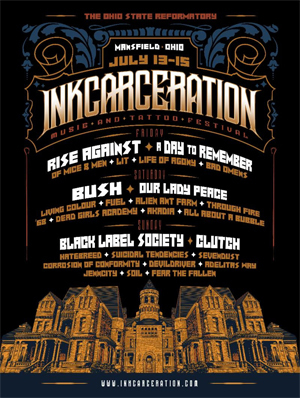 The inaugural INKCARCERATION Music and Tattoo Festival (July 13-15 in Mansfield, OH at the Historic Ohio State Reformatory) kicks off in less than one week! At INKCARCERATION, not only will attendees rock out to three days of live music from 30+ of today's greatest rock bands, they can also get tattooed by acclaimed local and regional artists, tour one of the most famous haunted reformatories of all time, enjoy tasty treats and refreshments from 15+ food trucks onsite, browse goods from a number of vendors, experience a full rock n' roll circus sideshow (brought to you by Hellzapoppin), and more. INKCARCERATION is pleased to introduce the festival's fantastic first year sponsors - Rockstar Energy Drink, Bud Light, Sierra Nevada Brewing Co., Coca-Cola and Dasani Water, McDonald's, PRS Guitars, Pony Powersports and Indian Motorcycle of Columbus, KingPin Tattoo Supply, Phoenix Brewery, Ronzworld Guitars, The Ohio Lottery, Mansfield Distributing (Bud Light, Budweiser, Yuengling, Modelo), and Heidelberg Distributing Co. (Sierra Nevada Brewing Co., 19 Crimes, Rhinegeist, Great Lakes Brewing Company, Mike's Hard Lemonade, Sugar Hill Rum, Jose Cuervo, Heroes Vodka, Tattoo Tequila, Freedom Bourbon). "McDonald's is proud to help sponsor INKCARCERATION and welcome people from all over the world to this fantastic music festival, offering great entertainment right here in our own back yard," says Jeff Monica, owner and operator of Richland County, Crestline, and Loudonville McDonald's restaurants. "Mansfield Distributing is a proud member of the Mansfield community and we are extremely excited to be partnering with INKCARCERATION Music and Tattoo Festival in bringing such an exciting event to our community," adds Mike Berry, VP of Mansfield Distributing. Frank Lark, VP of Marketing, Indian Motorcycle of Columbus adds, "The entire INKCARCERATION Music and Tattoo Festival management team has been the most professional and well-organized of any large-scale event I have been a part of for the last 25 years." "A tattoo convention? In the old Shawshank Redemption prison? With all those bands and talented tattooers? Count Kingpin in," says Brian Stover, Product Manager for KingPin Tattoo Supply. INKCARCERATION is presented in partnership with Destination Mansfield, Richland County Chamber of Commerce, 99.7 The Blitz, 100.7 WMMS, Alt 99.1, Loudwire, The Ohio State Reformatory, Kaplan Artist Group, RCS Productions, Spyder Signs and Graphics, and NEO Music Scene. Vending partners include State Farm Insurance, TGI Fridays, Acathla Clothing, The Outlaw Metalsmith, Crazy Cutters Custom Decals, Henna Jhenna, Shining Star Faces, LuLaRoe, Glen's Surplus, Providers for Healthy Living, Fred Hot Sauce, Lucky Duck Creations, Skullz Dollz, Lynne&Lucille, Shattered Illusions, DFK Designs, Creative Beauty, Urbnpop, and CB Entertainment. "Once again the Ohio State Reformatory will take center stage for an event that will draw attendees from across the country and Europe," according to Destination Mansfield-Richland County President, Lee Tasseff. "INKCARCERATION will bring a whole new level of impact and notoriety to the area. Early estimates for the three-day concert and tattoo show put the economic impact around $2.3 million while introducing Ohio State Reformatory and the community to thousands of new visitors." Electrifying artists set to perform at the music festival portion of INKCARCERATION include Rise Against, A Day to Remember, Bush, Black Label Society, Clutch, Our Lady Peace, Suicidal Tendencies, Fuel, Hatebreed, Sevendust, Living Colour, Of Mice and Men, DevilDriver, Corrosion of Conformity, Lit, Life of Agony, Alien Ant Farm, '68, Soil, Adelitas Way, The Convalescence, Bad Omens, Fear The Fallen, Dead Girls Academy, Akadia, Through Fire, and All About A Bubble. ReverbNation contest winners include Milwaukee, WI's AVENUES, Raleigh, NC's NIKOL, Bradley, IL's THE UNLAWFUL, and Columbus, OH locals ABSOLUTE HERO. With the concert happening outside, INKCARCERATION will feature close to 70 local and regional tattoo artists tattooing all weekend inside the reformatory. Appointments are recommended if there is a specific artist you would like to work with. All appointments should be made directly through the artist's websites and social media pages. INKCARCERATION will feature food from a collection of the area's best food trucks: Three Little Piggies BBQ, Island Noodles Florida, Tortilla Street Food, Bistro de Mohr, Zaki Grill, Loops, Holy Taco, Flora & Lily's Mexican Kitchen, Big Bamboo Concessions, Pizza Cottage Food Truck, GET LOADED, Swat , Lynettes Country BBQ, OH Pizza and Brew, Smash Time , The Gaucho & The Gringa, and Stone Pelican Rolling Cafe. See each link to learn more about each truck and read individual menus. There are still INKCARCERATION single day tickets available at just $65, which include an entire day's worth of activity for an affordable price. Weekend tickets start at $165 and all ticket holders will have access to the concert portion of the event, the tattoo festival, self-guided reformatory tours, the circus sideshow, and more. Single day & Weekend ticket VIP, starting at $180 are also available and will also include access to the air-conditioned VIP lounge offering lunch, dinner, viewing platform and a private bar, in addition to the listed activities above. Additional INKCARCERATION ticket and camping information, parking details, event hours, and other important FAQ's can be found at www.inkcarceration.com. INKCARCERATION is produced by INKcarceration LTD and Blueprint/Forward.